Amazing and abundant displays of locally grown peaches and watermelons have greeted me lately each day when I walk into the grocery store to shop for my clients. One of the first things I think of when I see a mountain of fresh peaches is peach cobbler. Watermelon is something I love all by itself or with feta cheese and drizzled with a good balsamic vinaigrette. You may have noticed I don’t do many desserts and sweet recipes. The reason is that hubby and I would then EAT said desserts and sweets and we don’t NEED to eat said desserts and sweets. If sweets are in the house, I [especially] would eat them until gone so they could no longer torment me. 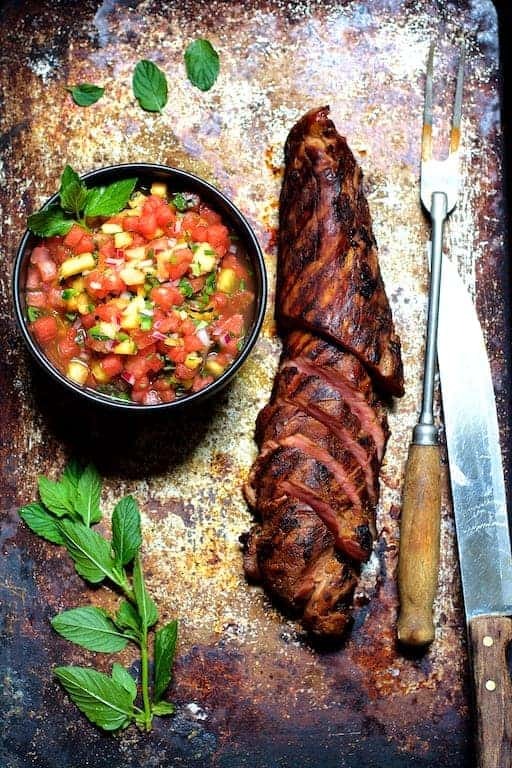 So, rather than something sweet, I wanted to use this amazing produce in a savory preparation instead and came up with this peach and watermelon salsa that pairs beautifully with a bourbon-marinated pork tenderloin. 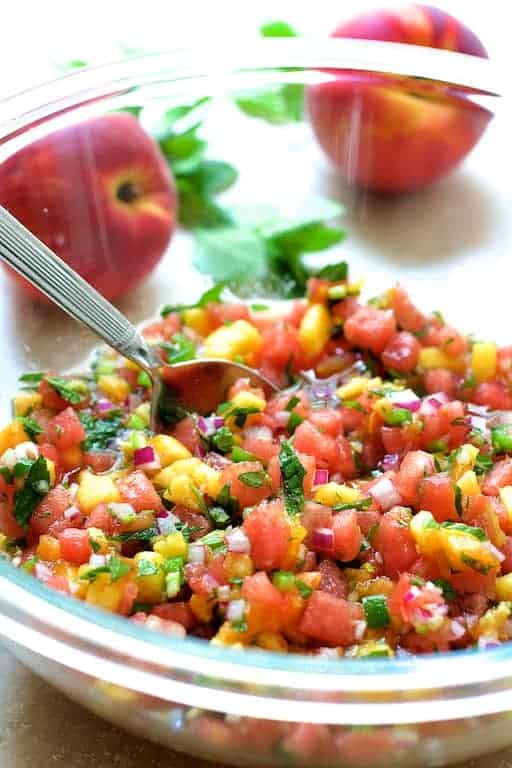 Fruit salsas can be made from almost any combination of fruit, but you want to include a spicy element like fresh chilies and an acid like vinegar or citrus juice to make all the flavors pop. I used white balsamic vinegar which is great to keep in your pantry. It adds that wonderful balsamic vinegar flavor without changing the color of your dish. The salsa does not hold well because of the watermelon. (Can you tell from my photos? Sometimes you have to surrender and roll with it because it’s just what happens.) 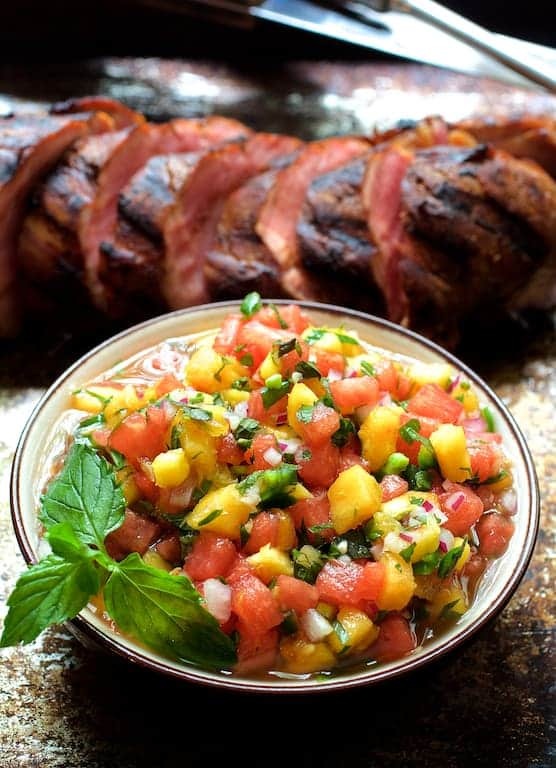 If you wish to make the salsa ahead, add the watermelon right before serving. 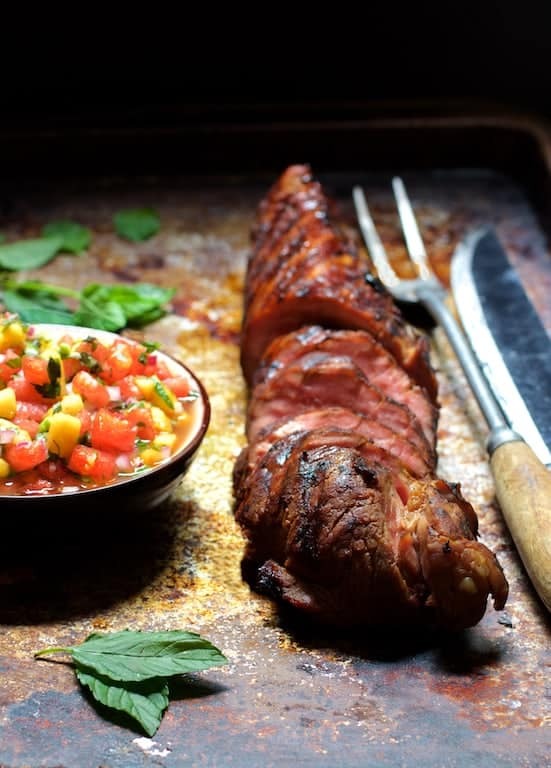 Let’s talk about pork tenderloin. I can not tell you how many times I see pork “tenderloin” and pork “loin” confused. They are two different cuts and if you’re unsure, ask the butcher. The tenderloin is a long and narrow muscle located at the end of the loin. Pork tenderloins are generally sold in packages of two. Each tenderloin weighs approximately one pound. They have a tough membrane called a silverskin that needs to be removed prior to cooking as the end result is rather chewy. I like to buy pork tenderloin when it’s on sale, divide up the package, trim, place each tenderloin in a gallon-size zipper-top bag and freeze. When you want to prepare one, thaw in the refrigerator. A single pork tenderloin takes approximately 24 hours to thaw. When thawed, add your marinade to the bag, place back in the refrigerator and you’re ready to roll! 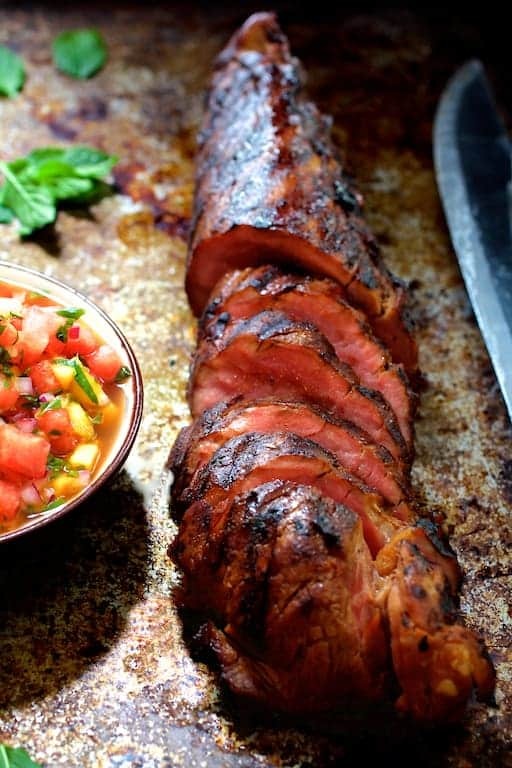 The marinade for this dish is a delicious pork tenderloin recipe my sister makes that is one of her go-to recipes. She pairs it with a quick and simple cold mustard sauce. Oh, and save the good bourbon for drinking on the side! An average bourbon will do. Reserve the marinade to brush over the pork tenderloin while it’s cooking. That’s okay to do as long as you don’t do it right before serving. The meat should still have time to cook when you brush the marinade on for the final time. Pork is safe to eat when the internal temperature reads 145 degrees. There is going to be some slight carryover cooking. Many people still have the heebie-jeebies about pink pork so if you want it thoroughly cooked, take it to 165 degrees. A good, high-quality meat thermometer is a wise investment. I’ve never found retail meat thermometers to be accurate so I use a professional-grade ThermoWorks Thermapen. Wise investment! This post contains an affiliate link. 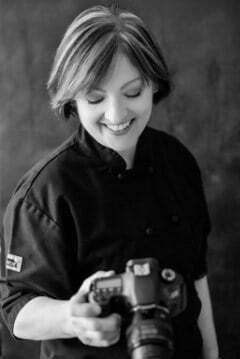 I only recommend and link to products I’m madly, deeply passionate about. Thank you for the support!